Chipotle Mexican Grill’s stock is expensive; but if you peel that away and focus on the long-term prospects for the underlying business, it offers the most potential in this group. Chipotle Mexican Grill (NYSE:CMG) is intimidating for many investors. This makes sense since the stock price is trading at around $550 per share and at 35 times forward earnings. However, if you ignore the stock price and valuation and instead focus on the underlying business, then you're going to find a company that has excellent long-term potential. Same-store sales are often referred to as comps. This pertains to sales increases or declines for restaurants that have been opened 12 or 13 months -- depending on the company. The reason comps are so important to investors is because unlike revenue, new store sales aren't included. When a company delivers strong comps, it indicates a loyal customer base and healthy repeat business. It's easy to see that Chipotle is the clear leader. Chipotle also finds itself in a positive cycle. Since comps are strong -- indicating high demand for its menu items and overall experience -- it plans to expand geographically, which will lead to revenue growth. For instance, Chipotle plans on opening 180-195 new restaurants in 2014. Furthermore, Chipotle has new brand investments, including ShopHouse Southeast Asian Kitchen and Pizzeria Locale. Both brands are very early in their growth stages. If they succeed, then Chipotle will become the modern version of Yum! Brands. Considering millennials have fallen in love with Chipotle Mexican Grill, they're likely to give ShopHouse Southeast Asian Kitchen and Pizzeria Locale a go. Chipotle will just have to market these brands correctly, letting millennials know they're both subsidiaries of Chipotle. At the moment, there are only five ShopHouse Southeast Asian Kitchen locations: Hollywood, Calif., Santa Monica, Calif., Los Angeles, Bethesda, Md., and Washington, D.C. Based on Google, Yelp, Foursquare, and Urbanspoon reviews, customers seem to be impressed. If you'd like to read these reviews for yourself, simply do a Google search for "ShopHouse Southeast Asian Kitchen." Customer reviews for "Pizzeria Locale" are even more impressive. Currently, there are only two locations: Boulder, Colo. and Denver. It's good news, not bad news, that there are very few locations for these new brands simply because it leaves a ton of room for growth. 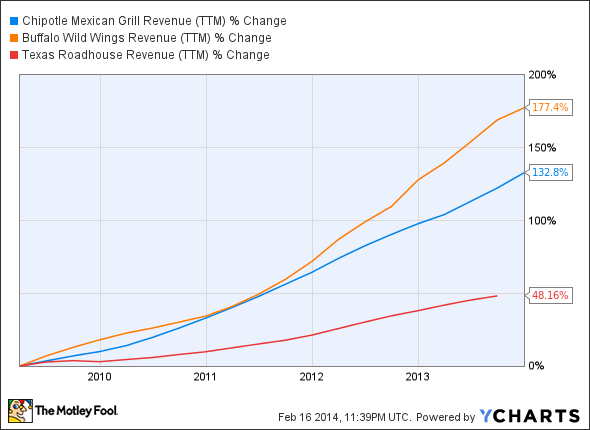 Could you imagine Chipotle Mexican Grill with three times the amount of its current success? Chipotle would rule the restaurant space, and this doesn't just pertain to fast casual. While Chipotle's trading at 35 times forward earnings makes it pricey, don't let the stock price scare you. There's a lot of growth left to be had to help Chipotle fill those shoes. These aren't the only reasons why Chipotle is likely to be the best long-term investment of the three aforementioned companies going forward. All three companies have seen consistent top-line growth, with Buffalo Wild Wings being the most impressive. This might make you think Buffalo Wild Wings is the top company of the group; but remember the importance of comps, and keep in mind that Chipotle looks like it's going to offer a lot more diversification down the road. 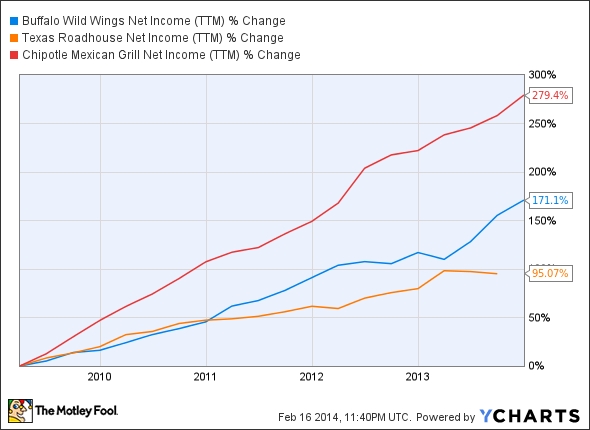 Buffalo Wild Wings is another great growth story, but it's not Chipotle. Chipotle swaps spots with Buffalo Wild Wings on this chart, but Texas Roadhouse remains a constant as the caboose. If you're considering an investment in one of these three companies, then Chipotle and Buffalo Wild Wings are likely to present better opportunities than Texas Roadhouse. However, this shouldn't be taken the wrong way. We're comparing three winners, not two winners and one loser. In other words, Texas Roadhouse is still a well-run company and remains a growth story. It's just not as impressive as its peers at the moment. The one selling point from a comparative angle is that Texas Roadhouse is the only company of the three to offer a dividend yield, which is 1.9%. As for Buffalo Wild Wings, its "Wings. Beer. Sports." approach has been a big hit. While it's still a growth story, there's a low barrier to entry, and the company lacks diversification. There will likely come a day when competition eats into its market share and growth stalls. Chipotle is setting itself up so it doesn't have to worry about being a one-trick pony. Its namesake brand is outperforming Buffalo Wild Wings and Texas Roadhouse, and its new brands offer diversification as well as massive growth potential. For the record, Texas Roadhouse also owns Aspen Creek (pizza, salads, Braised Beef Pot Roast, Homestyle Meatloaf, and more), but according to the company website, there are only two locations: Irving, Texas and Louisville, Ky., and there has been very little news about Aspen Creek. Perhaps more important is that one location in Fayetteville, N.C. has closed -- rarely a good sign for a new brand. Conclusively, Chipotle is likely to offer the most long-term potential of the three. Please do your own research prior to investing.